Cloudy skies early, then partly cloudy after midnight. Low 44F. NW winds at less than 5 mph, increasing to 10 to 20 mph..
Cloudy skies early, then partly cloudy after midnight. Low 44F. NW winds at less than 5 mph, increasing to 10 to 20 mph. Aoife McGenity joins the border Brexit protest March 30 on the Irish border, on the Old Dublin Road in Carrickcarnon, Ireland. 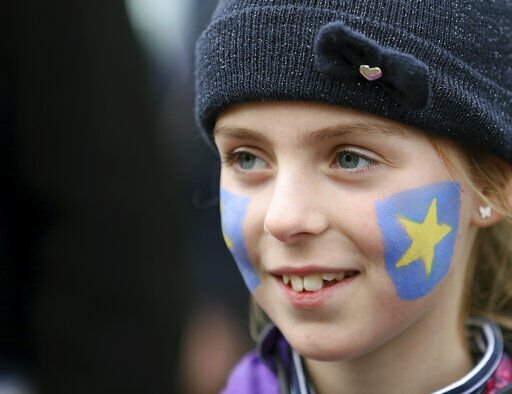 Border communities protested against Brexit by holding various rallies around Ireland. In this Nov. 24, 2018, file photo, British Prime Minister Theresa May, left, walks ahead of European Union chief Brexit negotiator Michel Barnier at EU headquarters in Brussels. 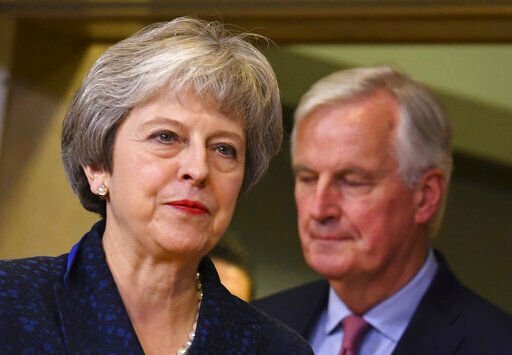 EU chief negotiator Michel Barnier said April 2 that a no-deal exit of Britain becomes day after day more likely after the UK parliament again rejected alternatives to the government's unpopular European Union divorce deal. Pig producers in the United Kingdom await the outcome of “Brexit” with a touch of anxiety to see how their businesses will be affected once a deal is achieved, or not, as the case may be. In order to set the scene of just where the UK pig industry is at present, there are about 5 million pigs in the UK, of which about 400,000 are breeding sows. There are about 10,000 pig farms in the UK. But about 90 percent of production comes from 1,000 assured farms — including 10 corporate companies that account for 35 percent of the breeding sows. In the 2018 year to November the UK exported almost 320,000 tonnes of pig meat — about 352,740 U.S. tons — including offal. Although 55 percent of it went to the European Union, the EU accounts for 64 percent of pig-meat exports by value. That’s because lesser-value frozen product and offal tends to be exported to third-world countries outside the EU. About 70 percent of the pig meat produced in the UK is actually consumed in the UK, but it does import about 60 percent of the pig meat consumed. In the 2018 year to November, the UK pig-meat imports totaled 903,000 tonnes, virtually all of which came from the EU. Only about half of that is fresh or frozen pork; a quarter is bacon and the final quarter is other processed products such as sausages and ham. There is a lot on the line for the thousands of UK pig producers if Brexit is handled badly, but there could be some opportunities given a favorable outcome. The AHDB Pork Board meets six times each year to determine English-pig-industry strategy and to ensure that English pig-levy-payer money is efficiently deployed in line with the AHDB Pork strategy. AHDB pork-strategy director, Angela Christison, considered a few Brexit scenarios. “On Brexit, given that the UK is a net importer of pork, our analysis shows that increased costs for importers could help support pig prices in the UK,” she said. “In addition being out of the EU may leave us in a more ‘nimble’ position to agree to trade agreements around the world. “Conversely any increases in food prices may lead to an adjustment to tariffs, which would attract more imports and so have a downward pressure on pig prices. The net impact of the industry hinges on the degree of freedom of trade and tariff barriers. However if the UK leaves the EU without a deal, that, according to Angela, would severely disrupt trade. She said, “A no-deal Brexit where the UK unilaterally drops tariffs is the worst-case scenario. Not least because there would be no ‘adjustment time,’ a potential increase in imports and a shortage of labor. “The potential impact is for pig-meat exports from the UK to the EU to be severely disrupted, or even impossible for a while. This would disrupt the carcass balance, which is currently addressed through trading with multiple EU and non-EU markets; it enables producers to optimize the value of each pig. No matter what the outcome of Brexit, the UK will need to focus on its core markets if its pig industry is to survive, but there could be new opportunities on the horizon. Christison said, “Even before the referendum took place, opening new markets and optimizing those we already sell in to, is a key part of AHDB’s work on behalf of the pork industry. In particular, opening access to non-EU markets has been a focus for AHDB’s market-development activity for some time. The Asian markets, particularly China, are key market to optimize carcass balance, while other markets such as the USA for example offer different opportunities in terms of high-end demand for certain British products. With 16 years experience behind him, award-winning agricultural journalist Chris McCullough is always on the hunt for his next story. He grew up on the family dairy farm in the heart of Northern Ireland and is based on the country’s east coast. He travels around the world to bring readers international news.